Thank you for letting us stay at this beautiful cabin. The cabin and the area is beautiful. We had a very relaxing time. Can't wait to come back. The place was beautiful. It's the nicest cabin we've stayed in We definitely recommend. Had an amazing time at Owls Roost! Hiked to waterfalls, checked out Bryson City and drove the road to nowhere. We will be back! We don't want to leave. The cabin and the Great Smoky Mtns were more than wonderful. Color change just starting. Cool temperatures were perfect. Smores and Hot Dogs made on the outdoor fireplace were delicious. Lots of laughter was shared during our stay. We all slept great in the comfy beds. Morning coffee on the back porch with an amazing view. Perfect start to each day. We will be back! Thank you for allowing us to stay in your beautiful cabin!! We felt at home from the first moment that we walked in the door. The views from the front porch and screened in porch are absolutely amazing!! We are already looking forward to staying here again next year. What a wonderful cabin. Breath taking views!! Thank you for sharing your beautiful cabin with us! We LOVED Owl's Roost! From the moment we pulled up to the cabin and saw bunnies in the yard, we knew we would have a relaxing and peaceful long weekend stay. The cabin views are amazing and the amenities met our expectations. We were a close drive to Bryson City, Nantahala River rafting, and Cherokee. We enjoyed a whitewater rafting trip with WildWater, a ride on the steam train, and a nice drive and hike up to Clingman's Dome. 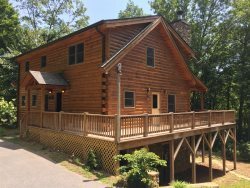 This cabin will be bookmarked as one of our favorites (along with Sundance at Deep Creek)! The wraparound porch with rocking chairs and large swing were where we spent most of our time. We also enjoyed the large screened-in living room. The gas fireplace and fire pit were wonderful surprises, and we made use of both. I also enjoyed the large jetted tub in the master bedroom. The staff at GSCR are always so friendly and helpful! On this stay, we realized the brakes on our vehicle needed repair. A quick call to the GSCR office led us to a mechanic who was honest and able to get us taken care of quickly. The great customer service from GSCR is why we are repeat customers with them! Exceeded our expectations! We are grateful for what you continually do to make Owls Roost exceptional! Every feature is appreciated! This was the best we have ever stayed at in the mountains. The view is beautiful. The ladies at GSCR are the best we have ever worked with, they are great. The cabin is really beautiful, loved the views and the cozy decor. Kitchen is great and fully equipped. The screened porch with fireplace is wonderful! Majestic views of the smokies! Spent every night on covered porch with wood burning fireplace making smores and enjoying the total peace. Great kitchen cookware and modern appliances. Also just minutes from spectacular waterfalls, hiking trails and grocery store. We will be planning a return soon! Came with friends to disconnect from work and enjoy the sights. We really enjoyed the view from the back porch and the screened in porch with fireplace. The kitchen was so nicely equipped for us foodies. We loved the drive to Indian Falls in Bryson City and Mingo Falls in Cherokee. We loved the screened in porch with fireplace. The cabin is beautiful, vert clean and the kitchen has everything you could need! We enjoyed our Christmas mountain getaway. We had a nice mountain style Christmas. The cabin is lovely and well appointed for a family. We hiked in the park and enjoyed Deep Creek. We saw the Elk at Cataloochee. We will be back! The view was amazing, the cabin has high ceiling and we loved the fireplace and the hot tub! The Christmas tree was a pleasant surprise. My contact was with Kelly and she was extremely helpful and patient. We had a wonderful time as we always do. We will be back. We had a blast at Owls Roost. The views were phenomenal and the ambience was unmatched. What a perfect getaway. The huge porch swing was an absolute delight during the warmer hours. We are already planning trip for next year! We had another amazing time at the Owls Roost Cabin. This is our second time visiting. Thank you again, we hope to visit again. I absolutely LOVE booking with Cathie! To say she is wonderful is an understatement! She always knows exactly what we are looking for and if our usual cabin in not available she goes above and beyond with other cabin choices to make sure all of our needs are met!